This article is about the Eric Clapton song. For other uses, see Change the World (disambiguation). In an interview with American Songwriter, Gordon Kennedy retold the recording history of the song: "'Change The World' was a song written over the course of a year by Tommy Sims, Wayne Kirkpatrick, and myself. On a recording session in Quad Studios in Nashville, in the early '90s, Wayne and I were recording some demos in an attempt to do the 'artist' thing. We recorded four songs that day, three of which wound up on Garth Brooks' Chris Gaines CD (this would happen several years later). During that session, Tommy was there playing bass and played us the nugget of an idea he had, wondering if it might be something that would work for the sound we were doing. He had the title and a chord progression and melody direction going. Wayne would ask him some months later for a tape of the idea so he could work on it. He wrote the lyrics to the chorus and all but one line of the second verse. Then, it went dormant again for a time before I asked Wayne about its progress. He gave me what he'd done on it. I finished writing the music, went to Columbus, Ohio and laid down a demo track with Tommy. He was there working on a church choir album. On the way home, I listened to a tape of the track and dictated lyrics into another little handheld recorder (I still have the micro-cassette!). I wrote the lyrics to the first verse and the missing line in the second verse. When I got home, I went into the studio and did a guitar and all of the vocals for a finished demo, the one Clapton heard later... None of the three of us were together when we wrote what we each wrote on the song". Although some of the recordings took place in London, most of the song's recording was conducted in Record Plant studios in Los Angeles, where for example Nathan East's bass parts were mixed and recorded. East also notes, the recording sessions were very busy, because many international successful artists wanted to work with Babyface at the time, however, the pop producer put Clapton and "Change the World" first. In 2013, Clapton explained his take on the song in an interview with MOJO magazine: "When I heard Tommy Sims' demo, I could hear Paul McCartney doing that, so I needed to, with greatest respect to Paul, take that and put it somewhere black. So I asked Babyface who, even though he may not be aware of it, gave it the blues thing. The first two lines I play on that song on the acoustic guitar are lines I quote wherever I can and they come from the beginning of "Mannish Boy" by Muddy Waters. On every record I make where I think, this has got a chance of doing well, I make sure I pay my dues on this. So I think I've found a way to do it, but it has to have one foot in the blues, even if its subtly disguised". 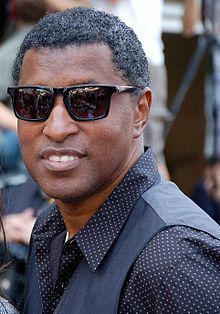 While journalists from MusicTunes were in conversation with the single's producer Babyface, the American R&B artist recalled: "It was a real pleasure working in the studio with Eric Clapton" and added, that Clapton's "music is legendary and he is truly one of the entertainment industry's musical geniuses". For the recording sessions, several people were in charge of the production and making for the single, including Brad Gilderman and Thomas Russo as the recording engineers, Robbie Robertson as the soundtrack's producer, Mick Guzauski worked on the final mix, Babyface produced the "Change the World" songs (single mix and instrumental), and Clapton produced the B-side "Danny Boy" by himself. All the recording actions were overseen by music supervisor Kathy Nelson. The music mastering for the 1996 single release was done at Oasis Mastering in Burbank, California. Clapton used a guitar for the recording and music video. Matthew Greenwald of AllMusic notes the song is "melodic, soulful [and] catchy", due to its folk-pop and acoustic-based conception. Billboard magazine's Paul Verna thinks the song also features christian music styles. In the song, the performer expresses his desire to communicate his love to an unnamed woman ("If I could reach the stars, I'd pull one down for you", "If I could be king, even for a day, I'd take you as my queen, I'd have it no other way"). This love, he fears, will go unrequited without a drastic change in his life ("That this love I have inside, is everything it seems, But for now I find, it's only in my dreams", "And our love will rule, in this kingdom we have made, Till then I'd be a fool, wishin' for the day"). Elton John's lyricist Bernie Taupin, who worked with Clapton and John on the 1992 single release "Runaway Train", uses this track an example of a song that can succeed without a great title or lyric. He told Musician magazine: "What sold that song, I believe, is production. And it had a good melody. But don't listen to the lyric. Because the lyric is appalling. It's a bad lyric. There are some rhymes in there that are really awful. But that's not what sold the song". The song is written in the key of E major. "Change the World" begins with an intro, which features a chord progression of E7, E major, E6sus4, E7, E6sus4, and E major chords, played around the E-based bass line, which later turns into a E major, F-sharp minor and G major bass line. The intro is followed by the first verse, which is accompanied by the intro chord progression and an A major, A6sus4, A7, A7, A6sus4, and A major chord progression for the B-section of the verse. After the E-major chord progression, including 6th and 7th chords was played again, it ends with a G#7 chord, leading to the C-section of every verse, consisting of an F#m7, G#7, C#m, Dmaj7, G#7, C#m, Dmaj7, G#7, C#m7, Cm7, Bm7, A, E/G#, G#m, Gm, F#m, ending to the E major chord. The first verse is followed by an interlude, which is identical to the first intro line. The accompaniment to the second verse and second chorus is identical to the ones before. A link is added with the lyric "Baby, if I could change the world", followed by Clapton's guitar solo, in which he played with the help of the E minor blues scale, ending his solo with the G sharp major pentatonic scale. After the solo, the chorus is repeated, now starting with the line "If I could change the world...", leading to the second link, which is repeated three times, before the song's outro, which is identical to the song's intro and interlude. All songs written and composed by Tommy Sims, Gordon Kennedy and Wayne Kirkpatrick, except where noted. Before Clapton's hit version was released, the song was recorded by country artist Wynonna Judd for her February 1996 album, Revelations (MCA Records). Her three-minute, nineteen-second take on the song is more of a neo-traditionalist country music track. Judd did not release her version as a single. Judd's interpretation was also released on the compilation album Best of America, Volume 2 for Curb Records on June 3, 2003. Eric Clapton's version of the song was released on July 5, 1996, on 7-inch vinyl, compact music cassette, and compact disc formats. It was later made available as a digital download single. 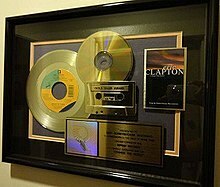 The publishing rights of Clapton's recordings belong to Warner Chappell Music, although the lyric writing license is owned by the Universal Music Publishing Group. The 1996 single was released and distributed through Reprise and Warner Bros. Records for worldwide territories. The title was also included on the Phenomenon soundtrack album, released by Reprise Records in June 1996. 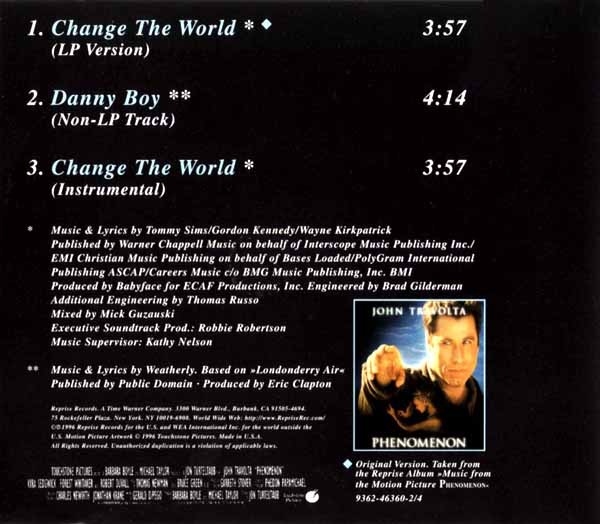 On February 11, 1997, "Change the World" was included on the 1997 Grammy Nominees compilation album, by Various Artists, where it was featured alongside other Grammy nominated and winning songs, including "Give Me One Reason" by Tracy Chapman and "Because You Loved Me" by Celine Dion. On February 2, 1999, the song was released by Warner Bros. Records as an extended play, accompanied by Clapton's 1998 studio effort Pilgrim. On October 12, 1999, the pop single was released as part of the number-one compilation album Clapton Chronicles: The Best of Eric Clapton for Reprise Records. On September 11, 2001, the song was released on the Clapton Chronicles: The Best of Eric Clapton and Unplugged double compilation for Warner Music Entertainment and was released Warner Bros. Records' Japan-only compilation album Ballads two years after, on December 23, 2003. 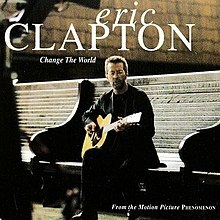 On October 9, 2007, "Change the World" was released on the Complete Clapton compilation for Reprise and Polydor Records, accompanying the release of Clapton's best-selling autobiography, and was part of the Ultimate Grammy Collection, celebrating contemporary pop music hits, released on November 27, 2007 for Shout! Factory. On April 28, 2015, the pop title was released on Clapton's compilation album Forever Man, recognizing the biggest hits, Clapton released under both Reprise and Warner Bros. Records. In total, Eric Clapton's version of "Change the World" has been featured on over 20 releases, including extended plays and various artists compilation albums. AllMusic critic Matthew Greenwald wrote that Clapton "smartly realized his strength in acoustic-based, soulful folk-pop and cut this fabulous side with noted producer Babyface" after the huge success of Unplugged and "Tears in Heaven". Greenwald called the song's homespun quality and overall sense of reality refreshing, and wrote that the release's "folksy melodic hook and soulful turnaround in the catchy chorus are handled by Clapton admirably here and, more importantly, with honesty and an artless grace". He rated the single 2.5 of five stars. Music journalist Frank Merschmeier wrote for his review on the official Swiss music charts chart that the song is without a question a "definitive lovesong" and goes on by liking the religious background note of the song. The German newspaper Süddeutsche Zeitung awarded the single release four out of five possible stars. Journalist Violetta Schranke calls "Change the World" a "beautiful pop song" with "delicate production" with lots of "guitar artwork" and "fanstastic bluesy singing". The critic also liked Babyface's background vocals. In Billboard magazine, journalist Datu Faison wrote that the recording is a perfect example how music has the power to unite musicians of different genres, nations and looks. He calls the title "great". Billboard magazine's Larry Flick notes, that "pairing rock hero Clapton with pop/soul maestro Babyface may seem totally incongruous. However, one listen to this positively electric single and you will be hoping for the two to collaborate on an entire album. Working with a sweet, uplifting lyric and melody, Clapton brings a worldly acoustic-blues favour to the table, while Babyface injects a splash of modern soul and pop gloss. Featured on the soundtrack to the new John Travolta movie, 'Phenomenon', this smacks of multiformat appeal". Critics from MusicTunes note, the Phenomenon soundtrack "is already an out-of-the-gate smash thanks to its debut single "Change the World", featuring the potent combination of an Eric Clapton performance with production by Babyface. It's the sort of innovative musical mix-and-match that not only evokes the timeless quality of that "mystical heartland" but points the way to an entirely new kind of creative synergy". Babyface's production was praised by fans and critics. The RIAA gold record award. "Change the World" is one of Clapton's best-selling singles alongside "I Shot the Sheriff", "Forever Man", "Wonderful Tonight", "Tears in Heaven", "Layla", "Cocaine", "Bad Love" and "Lay Down Sally". The title was a global Top 40 phenomenon, reaching the single sales charts in more than twenty countries and staying in the charts for two years in a row, from 1996 to 1998. In the United States, the song was a big hit, reaching eleven of the American Billboard charts. The single debuted on the Billboard Hot 100 in the middle of 1996 at number 55 with sales of more than 3,000 copies, gaining a so-called "Hot Shot Debut". Eventually peaking at position number five, the release was certified with a Gold disc, just three months after its release by the Recording Industry Association of America (RIAA), selling more than 500,000 copies while on chart in America. The single stayed 43 weeks on the Billboard Hot 100 chart and sold more than 700,000 copies by the end of 1996. In addition to that, "Change the World" peaked at number four on the Cashbox chart and sold more than 895,000 copies until August 1997. Also, the track debuted with a "Hot Shot/Airpower" certification on the Adult Contemporary and Adult Top 40 charts. The release topped the Adult Top 40 chart, where it stayed 38 weeks on chart and also spent 13 weeks at number one on the adult contemporary chart and remained on that chart for over a year and a half (81 weeks), a feat which was extraordinarily rare at the time. In addition, the single peaked at number two on the Mainstream Top 40 chart. By July 1998, "Change the World" sold more than one million copies in the United States alone. "Change the World" was also well received in the R&B and Hip hop scene, reaching position 54, while twenty weeks on the Hot R&B/Hip-Hop Songs chart and number 20 on the Hot R&B Singles Sales chart in the United States. The pop rock tune also received a lot of airplay in North America, reaching number two on the Hot 100 Airplay chart in 1996 and peaking at position three on the Hot 100 Recurrent Airplay chart in 1997. "Change the World" was the 13th most played song of 1996 by American radio stations all over the country. For the year-ending of 1996, the single release placed itself on number seven on the adult contemporary chart, number two on the Adult Top 40, position twelve on the Hot 100 Airplay chart and number 34 on the Top 100 Single Sales chart. In 1997, the single sales went down, however the track was still successful until the end of the year, peaking at number two on the year-end's Adult Contemporary, ranking at number ten on the Top Soundtrack Singles chart as well as being the 67th most purchased single and 55th most radio played song in the United States. In Canada, the single release topped both the RPM magazine's Adult Contemporary Tracks and Top Singles chart in July and August 1996. In The Record magazine's compilation, the single peaked at number ten on the singles chart in 1996. Here, the release reached the 1996 year-end charts, placing itself on number two on the adult contemporary chart and number three on the Top Singles compilation. In Australia, "Change the World" charted at number eight on the ARIA singles chart. In New Zealand, the pop single peaked at number three on the official single chart and was certified Gold by the Recording Industry Association of New Zealand (RIANZ) for sales of more than 7,500 copies in New Zealand. It was New Zealand's 37th best-selling single of 1996. When a maxi single version of the single was released in early 1997, it peaked at number seven on the Japanese albums chart, compiled by Oricon. In 2015, the song reached Billboard magazine's Japan Hot 100, where the song peaked at number 48. The single release was well received by British radio stations as "Change the World" peaked at number six on the Official Charts Company's airplay compilation in 1996. The hit single had two chart runs in the United Kingdom, the first of which the single peaked at number 18, its highest charting positions, and stayed five weeks on the British charts from July 20, 1996 to August 17, 1996. From September 21, 1996 to October 5, 1996, "Change the World" had a second chart run of three weeks on low positions (89, 100 and 98), charting a total of eight weeks in the United Kingdom. In Scotland, the single peaked at number 20 on the Official Charts Company's separate single chart for the country. Although "Change the World" reach the Top 40 in every European country it charted in, the Clapton single was only a medium success. In Austria, the single peaked at number ten on the Ö3 Austria Top 40 chart. In Flanders, the single reached number nine on the Ultratop Tipparade, and position 27 on the Ultratop single sales chart in Wallonia, where it was the 90th best-selling single release of the year. On the French Singles chart, "Change the World" peaked at number seven and was certified with a Gold disc by the Syndicat National de l'Édition Phonographique (SNEP) for sales figures overstepping the 250,000 mark. In Germany, the single reached number 30 on the Media Control charts and reached number 97 on the German year-end charts in 1996. The release peaked at number 22 on the Italian single chart, compiled by the Federazione Industria Musicale Italiana (FIMI) in 1996. In the Netherlands, "Change the World" placed itself on both the Dutch Top 40, peaking at number 39, and on the Single Top 100 chart, where it reached position 24. In Norway, the release peaked at number 15 on the VG-lista. The single reached number twelve on the Polish Lista Przebojów Programu Trzeciego (LP3) in 1996. In Sweden, the single reached number 22 on the Sverigetopplistan chart. In Switzerland, "Change the World" reached position number 21 on the country's hitparade. A shot of Clapton in the video. The music video was filmed at Hoboken Terminal in Hoboken, Hudson County, New Jersey. For the music video shooting, Clapton was provided with clothing, glasses, shoes and styling equipment by his long-time friend, Italian fashion designer Giorgio Armani. In the music video, mostly Clapton is shown singing and playing "Change the World" at the Hoboken Terminal, either using an early signature Martin acoustic guitar, or a vintage model. The song's producer Babyface is rarely seen playing and singing the pop song in front of the camera. While Clapton and Babyface are performing the song at one of New York metropolitan area's major transportation hubs, the scene is completely empty of both people and obstacles. Every once in a while, the performers and passengers, who come later to the terminal, disappear and appear as the director of the video uses an obliterate video effect. The video was originally released in 4:3 format and was re-sized in 1999 to a high-definition picture. The music video gained a lot of popularity, especially in the United States, topping the music video streaming chart of VH1 in October 1996. The release also reached number four on MuskVideo's power play chart, and peaked at number nine on the most played videos of MTV compilation as reported by Billboard. Although "Change the World" is best known by Eric Clapton's unplugged acoustic version, an electric performance of the song was featured on Babyface's 1997 live album, MTV Unplugged NYC 1997, released on November 25 the same year, with Clapton on co-lead vocals and electric guitar. Babyface also served as the song's producer for the electric guitar take. This interpretation of the hit song is of seven minute and 33 second duration. AllMusic critic Stephen Thomas Erlewine calls the duo "deliver[s the tune] with a smooth authority that borders on slickness". The Babyface-featuring Eric Clapton version was also released on the two compilation albums A Collection of His Greatest Hits and Wake Up Everybody in 2000 and 2004. On February 27, 1997, Clapton and Babyface performed the song at the 39th Annual Grammy Awards, at Madison Square Garden. The live album One More Car, One More Rider was recorded during the 2001 tour at Los Angeles' Staples Center on August 18 and 19, 2001 and also features a live interpretation of the song. Due to fan and TV recordings around the globe, the song was often illegally released on bootleg. Note: Since September 4, 2012, "Change the World" is available worldwide as a digital download single. ^ "VH1 Legends – Eric Clapton Documentary". VH1. YouTube. Retrieved November 1, 2015. ^ Schlansky, Evan (February 7, 2011). "Writer Of The Week: Gordon Kennedy | American Songwriter". American Songwriter. americansongwriter.com. Retrieved August 7, 2015. ^ a b c d "Soundtrack Album: Phenomenon". The Band. theband.hiof.no. June 1996. Retrieved October 31, 2015. ^ Steffen, Chris (January 23, 2015). "Bassist Nathan East on Eric Clapton and "Change the World" & Plus, Watch His Documentary". AllMusic. Rovi Corporation. Retrieved October 31, 2015. ^ Simmons, Michael (May 2013). "Music has saved my life on many occasions". MOJO Magazine (234). Retrieved August 7, 2015. ^ "Eric Clapton – Change The World (CD) at Discogs". Discogs. Retrieved October 31, 2015. ^ "Discography List – Oasis Mastering". Oasis Mastering. Retrieved October 31, 2015. ^ a b Eric Clapton (July 5, 1996). Change the World (Digital format sound recording). Reprise Records. 9362-46360-214. Retrieved October 31, 2015. ^ a b c "Eric Clapton – Change The World (Official Music Video) – Video". Warner Music. Metacafe. Retrieved October 31, 2015. ^ a b c "Change the World – Eric Clapton | Listen, Appearances, Song Review | AllMusic". AllMusic. Rovi Corporation. Retrieved August 7, 2015. ^ Verna, Paul (November 22, 1997). "Singles & Albums". Billboard Magazine. 109 (47). ISSN 0006-2510. Retrieved October 31, 2015. ^ a b c "Change the World – Eric Clapton | Lyrics | AllMusic". AllMusic. Rovi Corporation. Retrieved October 31, 2015. ^ "Change The World by Eric Clapton Songfacts". Musicians magazine. Songfacts.com. Retrieved August 7, 2015. ^ Sarga, Michael. "Eric Clapton – Change the World Chords & Tabs". Ultimate Guitar Four-Star Tabs and Explenations. ultimate-guitar.com. Retrieved October 31, 2015. ^ "Change the World Liner Notes & Credits". Reprise Records. Discogs. Archived from the original on October 31, 2015. Retrieved October 31, 2015. ^ a b "Eric Clapton – Change The World – austriancharts.at > Tracks". Ö3 Austria Top 40 (in German). Steffen Hung – Hung Medien. Archived from the original on October 1, 2015. Retrieved October 30, 2015. ^ a b "Eric Clapton Change The World US cassette single (75600)". Eil.com. Retrieved October 30, 2015. ^ a b c "Eric Clapton – Change The World – hitparade.ch > Tracks". Schweizer Hitparade (in German). Steffen Hung – Hung Medien. Archived from the original on November 22, 2015. Retrieved October 30, 2015. ^ McCall, Michael. "Revelations – Wynonna Judd | Songs, Reviews, Credits, Awards | AllMusic". AllMusic. Rovi Corporation. Retrieved October 31, 2015. ^ "Change the World – Wynonna Judd | Song Info | AllMusic". AllMusic. Rovi Corporation. Retrieved October 31, 2015. 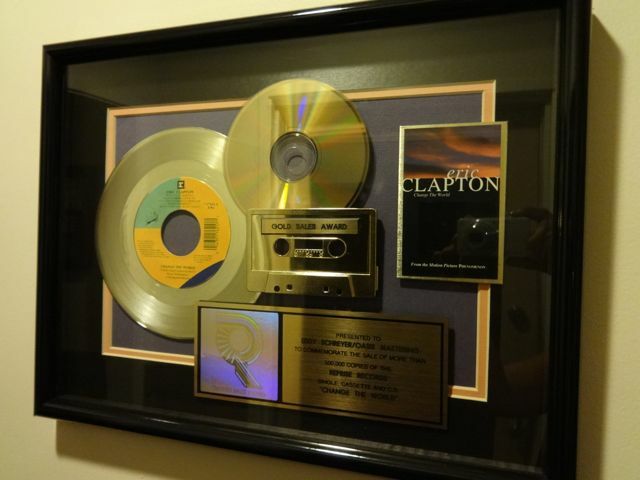 ^ a b "Eric Clapton – Change the World RIAA Gold Sales Award". Oasis Record Collection. Oasis Mastering. Retrieved October 31, 2015. ^ a b "Change The World: Eric Clapton: MP3 Downloads". Amazon.com. Retrieved October 31, 2015. ^ Dome, Malcome (2015). "Studio". Forever Man (Compact Disc Liner Notes). Reprise Records. p. 5. 9362-49278-9. ^ "Eric Clapton Change The World US CD single (CD5 / 5") (129717)". Eil.com. Retrieved October 31, 2015. ^ Ankeny, Jason. "1997 Grammy Nominees – Various Artists | Songs, Reviews, Credits | AllMusic". AllMusic. Rovi Corporation. Retrieved October 31, 2015. ^ "Pilgrim/Change the World [EP] – Eric Clapton | Songs, Reviews, Credits | AllMusic". AllMusic. Rovi Corporation. Retrieved October 31, 2015. ^ Erlewine, Stephen Thomas. "Clapton Chronicles: The Best of Eric Clapton – Eric Clapton | Songs, Reviews, Credits | AllMusic". AllMusic. Rovi Corporation. Retrieved October 31, 2015. ^ Bush, John. "Unplugged/Clapton Chronicles: The Best of Eric Clapton – Eric Clapton | Songs, Reviews, Credits | AllMusic". AllMusic. Rovi Corporation. Retrieved October 31, 2015. ^ Erlewine, Stephen Thomas. "Ballads – Eric Clapton | Songs, Reviews, Credits | AllMusic". AllMusic. Rovi Corporation. Retrieved October 31, 2015. ^ Erlewine, Stephen Thomas. "Complete Clapton – Eric Clapton | Songs, Reviews, Credits | AllMusic". AllMusic. Rovi Corporation. Retrieved October 31, 2015. ^ Brown, Marisa. "Ultimate Grammy Collection: Contemporary Pop – Various Artists | Songs, Reviews, Credits | AllMusic". AllMusic. Rovi Corporation. Retrieved October 31, 2015. ^ "Forever Man – Eric Clapton | Songs, Reviews, Credits | AllMusic". AllMusic. Rovi Corporation. Retrieved October 31, 2015. ^ "Change the World (US) – Eric Clapton | Reviews | AllMusic". AllMusic. Rovi Corporation. Retrieved October 30, 2015. ^ Schranke, Violetta (July 23, 1996). "Neue Single-Veröffentlichungen". Süddeutsche Zeitung: 13. ^ a b "Eric Clapton – Change the World". Billboard Magazine. Nielsen Business Media, Inc. 108 (29): 16, 18, 19, 72. July 20, 1996. ISSN 0006-2510. Retrieved October 30, 2015. ^ Flick, Larry (June 15, 1996). "Top Pop Singles". Billboard Magazine. 108 (24): 74. ISSN 0006-2510. Retrieved October 30, 2015. ^ "Eric Clapton ReImagined By Chris Young | GRAMMY.com". Grammy Awards. The Recording Academy. October 11, 2013. Retrieved November 1, 2015. ^ a b c d e f "Year-end Charts of 1996". Billboard Magazine. 108 (52). December 28, 1996. ISSN 0006-2510. Retrieved October 30, 2015. ^ Canadian Global Almanac 2002. C D G Books Canada, Inc. Global Press. 2002. p. 848. ISBN 9781553350064. Retrieved November 1, 2015. ^ "ASCAP Film and Television Music Awards (1997)". Internet Movie Database. Retrieved November 1, 2015. ^ "BMI Film & TV Awards (1997)". Internet Movie Database. Retrieved November 1, 2015. ^ "Rock On The Net: Grammy Awards: Song Of The Year". Rock On The Net. Retrieved November 1, 2015. ^ "Rock On The Net: Grammy Awards: Record of the Year". Rock On The Net. Retrieved November 1, 2015. ^ "Rock On The Net: Grammy Awards: Best Pop Solo Performance". Rock On The Net. Retrieved November 1, 2015. ^ "MTV Movie Awards (1997)". Internet Movie Database. Retrieved November 1, 2015. ^ Lichtman, Irv (March 15, 1997). "With PolyGram, Kennedy Scores The Hit That Changes His World". Billboard Magazine. 109 (11): 66. ISSN 0006-2510. Retrieved November 1, 2015. ^ "Phenomenon – Awards – IMDb". Internet Movie Database. Retrieved November 1, 2015. ^ May, Thomas (1998). "Journeyman, Pilgrim, Legend". Q Magazine. ^ "Top 365 Songs of the Twentieth Century". Recording Industry Association of America. The Association Admiration Aggregation. Retrieved November 1, 2015. ^ "Top 100 Songs of 1996". Z100 Is New York's #1 Hit Music Station. 2015. Archived from the original on November 1, 2015. Retrieved November 1, 2015. ^ Roberty, Marc (1995). The Complete Guide to the Music of Eric Clapton. United Kingdom: Omnibus Press. ISBN 978-0711943056. ^ "Hits of the World". Billboard Magazine. Nielsen Business Media, Inc. 110 (2). January 10, 1998. ISSN 0006-2510. Retrieved October 30, 2015. ^ a b "American single certifications – Eric Clapton – Change the World". Recording Industry Association of America. Retrieved 24 January 2016. If necessary, click Advanced, then click Format, then select Single, then click SEARCH. ^ a b "Eric Clapton Chart History (Hot 100)". Billboard. Retrieved October 30, 2015. ^ "Best-Selling Records of 1996". Billboard Magazine. Nielsen Business Media, Inc. 109 (3): 61. January 18, 1997. ISSN 0006-2510. Retrieved October 30, 2015. ^ a b "Cash Box Top 100 – 1996 for Week ending September 21, 1996". Cashbox Single Charts. 50.6.195.142 Archives. Archived from the original on June 30, 2015. Retrieved October 30, 2015. ^ "Change the World". Billboard Magazine. 109 (35). August 30, 1997. ISSN 0006-2510. Retrieved October 30, 2015. ^ "Radio Programming". Billboard Magazine. 108 (25): 89. June 22, 1996. ISSN 0006-2510. Retrieved October 30, 2015. ^ a b "Eric Clapton Chart History (Adult Pop Songs)". Billboard. Retrieved October 30, 2015. ^ a b c "Hot 100 Singles Sales – Adult Contemporary". Billboard Magazine. Nielsen Business Media, Inc. 108 (32): 68, 77. August 10, 1996. ISSN 0006-2510. Retrieved October 30, 2015. ^ a b "Eric Clapton Chart History (Pop Songs)". Billboard. Retrieved October 30, 2015. ^ a b Applefeld Olson, Catherine (July 11, 1998). "Soundtracks Spark Chart Heat" (PDF). Billboard Magazine. 110 (28): 85. ISSN 0006-2510. Retrieved November 28, 2015. ^ a b "Eric Clapton Chart History (Hot R&B/Hip-Hop Songs)". Billboard. Retrieved October 30, 2015. ^ a b "Hot R&B Single Sales". Billboard Magazine. 108 (31): 31. August 3, 1996. ISSN 0006-2510. Retrieved October 30, 2015. ^ a b "Hot 100 Airplay Singles". 108 (39). Nielsen Business Media, Inc. September 28, 1996: 103. ISSN 0006-2510. Retrieved October 30, 2015. ^ a b "Hot 100 Recurrent Airplay". 109 (22). Nielsen Business Media, Inc. May 31, 1997: 99. ISSN 0006-2510. Retrieved October 30, 2015. ^ a b c d "Year-end Charts of 1997". Billboard Magazine. 109 (52). December 27, 1997. ISSN 0006-2510. Retrieved October 30, 2015. ^ a b "RPM Adult Contemporary Tracks" (PHP). RPM Magazine. 63 (24). July 29, 1996. Retrieved October 30, 2015. ^ a b "RPM 100 Hit Tracks" (PHP). RPM Magazine. 63 (25). August 5, 1996. Retrieved October 30, 2015. ^ a b "Hits of the World". Billboard Magazine. Nielsen Business Media, Inc. 108 (57): 68. November 23, 1996. ISSN 0006-2510. Retrieved October 30, 2015. ^ a b "Year-end Top 100 Adult Contemporary Hits". RPM Magazine. 64 (18). Library and Archives Canada. December 16, 1996. Retrieved October 30, 2015. ^ a b "Year-end Top 100 Hit Tracks". RPM Magazine. Library and Archives Canada. December 16, 1996. Retrieved October 30, 2015. ^ a b "Australian-charts.com – Eric Clapton – Change the World". ARIA Top 50 Singles. Retrieved October 30, 2015. ^ a b c "Charts.nz – Eric Clapton – Change the World". Top 40 Singles. Retrieved October 30, 2015. ^ "New Zealand single certifications – Eric Clapton – Change the World". Recorded Music NZ. Archived from the original on October 26, 2015. Retrieved October 26, 2015. ^ a b "Top Selling Singles of 1996". Recorded Music NZ. The Official New Zealand Music Chart. Retrieved October 30, 2015. ^ a b "Hits of the World". Billboard Magazine. Nielsen Business Media, Inc. 109 (12): 66. March 22, 1997. ISSN 0006-2510. Retrieved October 30, 2015. ^ a b "Eric Clapton Chart History (Japan Hot 100)". Billboard. Retrieved October 30, 2015. ^ a b "Hits of the UK". Billboard Magazine. Nielsen Business Media, Inc. 108 (33): 54. August 17, 1996. ISSN 0006-2510. Retrieved October 30, 2015. ^ "Change the World | full Official Chart History | Official Charts Company". The Official Charts Company. The Official Charts. Retrieved October 30, 2015. ^ a b "Official Scottish Singles Sales Chart Top 100". Official Charts Company. Retrieved October 30, 2015. ^ a b "Austriancharts.at – Eric Clapton – Change the World" (in German). Ö3 Austria Top 40. Retrieved October 30, 2015. ^ a b "Ultratop.be – Eric Clapton – Change the World" (in Dutch). Ultratip. Retrieved October 30, 2015. ^ a b c "Ultratop.be – Eric Clapton – Change the World" (in French). Ultratop 50. Retrieved October 30, 2015. ^ a b "ULTRATOP BELGIAN CHARTS – RAPPORTS ANNUELS 1996" [Ultratop Belgian Charts – 1996 Year-end charts]. GfK Entertainment (Ultratop) (in French). Steffen Hung – Hung Medien. Archived from the original on October 18, 2014. Retrieved October 30, 2015. ^ a b "Lescharts.com – Eric Clapton – Change the World" (in French). Les classement single. Retrieved October 30, 2015. ^ a b c "French single certifications – Eric Clapton – Change the World" (in French). Syndicat National de l'Édition Phonographique. Retrieved 24 January 2016. ^ a b "Offiziellecharts.de – Eric Clapton – Change the World". GfK Entertainment Charts. Retrieved October 30, 2015. ^ a b "Hits 1996 – Deutschland – Single-Charts" [German Hit Singles in 1996] (in German). Chartsurfer.de. Retrieved October 30, 2015. ^ a b "Hit Parade Italia – Indice per Interprete: C > Clapton, Eric" [Italian Music Charts – Positions for selected artists: C > Clapton, Eric]. Federazione Industria Musicale Italiana (in Italian). Hit Parade Italia. Retrieved October 30, 2015. ^ a b "Nederlandse Top 40 – Eric Clapton" (in Dutch). Dutch Top 40. Retrieved October 30, 2015. ^ a b c "Dutchcharts.nl – Eric Clapton – Change the World" (in Dutch). Single Top 100. Retrieved October 30, 2015. ^ a b c "Norwegiancharts.com – Eric Clapton – Change the World". VG-lista. Retrieved October 30, 2015. ^ a b c "Eric Clapton & Babyface – Change the World". Lista Przebojów Programu Trzeciego (in Polish). Polskie Radio SA. Retrieved October 30, 2015. ^ a b "Swedishcharts.com – Eric Clapton – Change the World". Singles Top 100. Retrieved October 30, 2015. ^ a b "Swisscharts.com – Eric Clapton – Change The World". Swiss Singles Chart. Retrieved October 30, 2015. ^ "Lights, camera, action – Hoboken Terminal is a place to see and be seen" (PDF). New Jersey Transit. February 2007. Archived from the original (PDF) on October 31, 2015. Retrieved October 31, 2015. ^ Roberty, Marc (November 26, 2013). Eric Clapton – Day by Day: The Later Years 1983–2013. Backbeat Books. ISBN 978-1617130533. ASIN 1617130532. ^ "Giorgio Armani Stage Suit Pale Brown Reviews & Prices | Equipboard®". Equipboard. Equipboard, Inc. Archived from the original on March 4, 2016. Retrieved October 31, 2015. ^ "Clapton Chronicles: The Best of Eric Clapton (Video 1999) – IMDb". Internet Movie Database. Retrieved October 31, 2015. ^ "Billboard Video Monitor". Billboard Magazine. Nielsen Business Media, Inc. 108 (42): 97. October 19, 1996. ISSN 0006-2510. Retrieved October 31, 2015. ^ "Billboard Video Monitor". Billboard Magazine. Nielsen Business Media, Inc. 108 (27): 98. July 6, 1996. ISSN 0006-2510. Retrieved October 31, 2015. ^ "Billboard Video Monitor". Billboard Magazine. Nielsen Business Media, Inc. 108 (43): 89. October 26, 1996. ISSN 0006-2510. Retrieved October 31, 2015. ^ Erlewine, Stephen Thomas. "MTV Unplugged NYC 1997 – Babyface | Songs, Reviews, Credits | AllMusic". AllMusic. Rovi Corporation. Retrieved October 31, 2015. ^ "Change the World – Babyface, Eric Clapton | Song Info | AllMusic". AllMusic. Rovi Corporation. Retrieved October 31, 2015. ^ "Clapton + Babyface – Change the World '97". YouTube. Retrieved October 31, 2015. ^ "Eric Clapton – One More Car One More Rider: Eric Clapton: Movies & TV". Amazon.com. 2002-11-05. Retrieved October 31, 2015. ^ Erlewine, Stephen Thoms. "One More Car, One More Rider – Eric Clapton | Songs, Reviews, Credits | AllMusic". AllMusic. Rovi Corporation. Retrieved October 31, 2015. ^ "Bootleg Abmahnungen: Abmahnungen von Sasse und Partner für Eric Clapton" [Illegal bootleg recordings: Sasse & Partner sues publishers of Eric Clapton bootlegs] (in German). anwalt24.de. February 27, 2015. Archived from the original on December 22, 2015. Retrieved October 31, 2015. ^ a b c d "Music and Media" (PDF). American Radio History. Retrieved 10 May 2016. ^ "Official Singles Chart Top 100". Official Charts Company. Retrieved October 30, 2015. ^ "Official Physical Singles Chart Top 100 | Official Charts Company". The Official Charts Company. Retrieved October 30, 2015. ^ "Billboard Top 100 - 1996". Archived from the original on 2009-03-01. Retrieved 2010-08-27. ^ "Japanese single certifications – Eric Clapton – Change the World" (in Japanese). Recording Industry Association of Japan. Retrieved 24 January 2016. ^ "Japanese single certifications – E. Clapton – Change the World" (in Japanese). Recording Industry Association of Japan. Retrieved 24 January 2016. ^ "New Zealand single certifications – Eric Clapton – Change the World". Recorded Music NZ. Retrieved 24 January 2016. ^ Widran, Jonathan. "Cool Breeze – Alto Reed | Songs, Reviews, Credits | AllMusic". AllMusic. Rovi Corporation. Retrieved November 1, 2015. ^ "Various – Dancemania Speed 4 (CD) at Discogs". Discogs. Retrieved November 1, 2015. ^ "Gerald Albright – Groovology". Chris Mann. Smooth-jazz.de. Retrieved November 1, 2015. ^ "該当するページが見つかりません | ORICON STYLE" [Wings of Words (Regular Edition) by CHEMISTRY| ORICON STYLE] (in Japanese). Oricon Style. Retrieved November 1, 2015. ^ "Eric Clapton Change The World Australian CD single (CD5 / 5") (68926)". Eil.com. Retrieved August 7, 2015. ^ "Brazilian CD Single – Eric Clapton – Change the World". cdandlp.com. Archived from the original on October 31, 2015. Retrieved October 31, 2015. ^ "Eric Clapton Change The World Canadian CD single (CD5 / 5") (100585)". Eil.com. Retrieved August 7, 2015. ^ "Eric Clapton Change The World German CD single (CD5 / 5") (78667)". Eil.com. Retrieved August 7, 2015. ^ "Eric Clapton – Change The World at Discogs". Discogs. Retrieved October 31, 2015. ^ "Eric Clapton Change The World Japanese CD single (CD5 / 5") (66762)". Eil.com. Retrieved August 7, 2015. ^ "Eric Clapton Change The World Spanish CD single (CD5 / 5") (170773)". Eil.com. Retrieved August 7, 2015. ^ "Eric Clapton Change The World Taiwanese CD single (CD5 / 5") (218155)". Eil.com. Retrieved August 7, 2015. ^ "Eric Clapton Change The World UK CD single (CD5 / 5") (367535)". Eil.com. Retrieved August 7, 2015. Awards for "Change the World"
This page was last edited on 14 April 2019, at 03:16 (UTC).